What has the word 'mend' got to do with Advent? It is the Advent Word for today in the calendar I am following. Advent is about waiting expectantly for the coming of Christ to judge the world. That is the great Christian hope: that in the end light fully overcomes darkness, evil will be destroyed. God will, with justice and mercy, mend what is broken and restore to wholeness what is wounded. In the meantime, we live in a broken world where each can play a part in repairing relationships. No one can do everything but all can do something. Even 1 needle and piece of thread can be used to stitch a wound so it may heal. There's a lot of truth in the proverb, 'a stitch in time saves nine'. When something is in need of repair it is better to act sooner rather than later when things may get worse. Just think about potholes in the road, or tiles missing from a roof. that knows how to mend." For some the first need is to forgive oneself in order to receive God's forgiveness and be open to forgive others. In God's hands is the 'needle that knows how to mend'. It is the needle of love, applied in precisely the right place and right time, shown in the coming of Christ as vulnerable baby and as Saviour who died for the sins of the whole world, including those people we find hardest to forgive. Forgiveness isn't easy. It is costly and is not always instantly possible. In the post, 'Forgive how often?' I wrote that "Forgiveness is a process, a way of life, a choice." The decision to forgive can be immediate, but the process of actually doing so takes time. 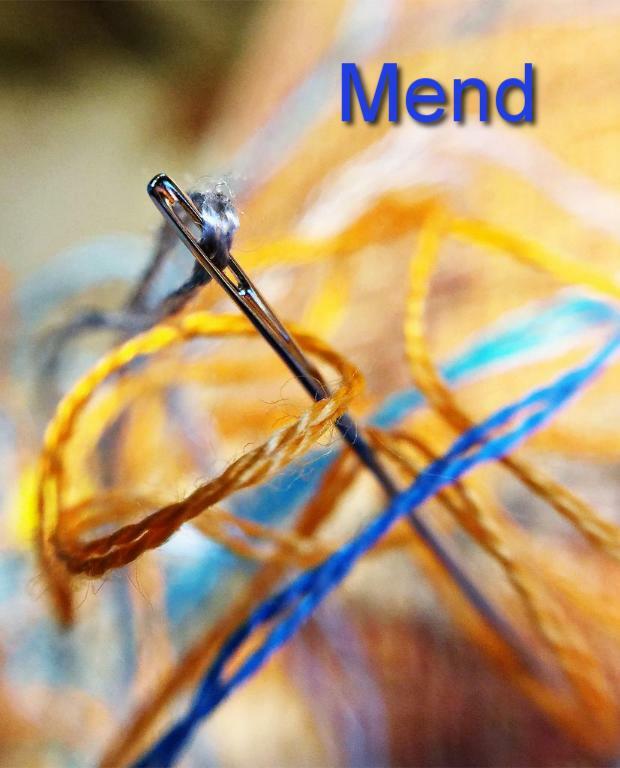 Mending takes time, but is worth it. So, what do you need to mend this Advent, in order to be ready for Christmas and for Christ's coming?